To most people, the concept of a hidden paradise, a place like novelist James Hilton’s Shangri-La with all its richness and breathtaking beauty hidden away and preserved through time by gigantic mountain ranges, is nothing more than stuff for fiction. Then again, not a lot of people have had the good fortune of setting foot in the historic port city of Galle or walked through the fabled streets of its magnificent Galle Fort. Preserved through the centuries so that it looks almost exactly the way it did during its period of Dutch colonization, Galle Fort stands as a testimonial to the fact that it's still possible in these modern times to find a place where the passage of time seems to have been put on slow mode. 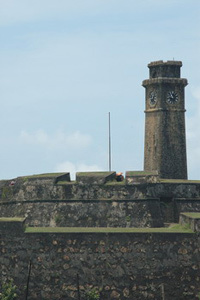 Uncluttered and untarnished by modernization, the Galle Fort serves as a true memorial to Galle city's rich and glorious past. Recognizing the value of this effort and the wealth of legacy it leaves for today's generation, the United Nations Educational, Scientific and Cultural Organization (UNESCO) listed the Galle Fort as a world heritage site in 1988. Copyright 2007. FortGalle.com | All rights reserved.